Thirteen Buddhist Deities of Japan — Exploring Their Origins & Roles in Japanese Death Rites & Funerary Art. Over 70 annotated photos, copious reference notes, 84 slides. July 2018. Jump directly to the Condensed Visual Classroom Guide to Japan’s Thirteen Buddhist Deities. The Thirteen Buddhist Deities (Jūsanbutsu 十三仏) are a purely Japanese convention. The standardized group of thirteen emerged in the mid-14th century, but in its formative years (12th & 13th centuries), the group’s composition varied significantly and included only ten, eleven, or twelve members. The group is important to all schools of Japanese Buddhism. Even today, the thirteen are invoked at thirteen postmortem rites held by the living for the dead, and at thirteen premortem rites held by the living for the living. As shown herein, the thirteen are associated with the Seven Seventh-Day Rites 七七斎, the Six Realms of Karmic Rebirth 六道, the Buddhas of the Ten Days of Fasting 十斎日仏, the Ten Kings of Hell 十王, the Secret Buddhas of the Thirty Days of the Month 三十日秘仏, and other groupings. The Thirteen provide early examples of Japan’s medieval honji-suijaku 本地垂迹 paradigm, wherein local deities (suijaku) are recognized as avatars of the Buddhist deities (honji). This classroom guide is unique in three ways: (1) it presents over 70 annotated images, arranged chronologically and thematically, from the 12th to 20th century; (2) it offers four methods to easily identify the individual deities; and (3) it provides visual evidence that the thirteen are configured to mimic the layout of the central court of the Womb World Mandala 中台八葉院. █ KEYWORDS. 十三仏 or 十三佛・十王・七七斎・七七日・中有・中陰・六齋日・六道 ・十斎日仏・三十日秘仏・本地垂迹 ・兵範記・中有記・ 預修十王生七経 ・地蔵十王経 ・佛説地藏菩薩發心因縁十王經・弘法大師逆修日記事 ・下学集. █ An Adobe PDF version (printable, searchable) is also available for download. Daikokuten Iconography in Japan — From Hindu Destroyer to Buddhist Protector to Japanese Santa Claus. Over 300 annotated photos, copious reference notes, 47 slides. Oct. 2017. The main goal of Condensed Visual Classroom Guide — Daikokuten Iconography in Japan is to illustrate “visually” Japan’s taming of a demonic, bloodthirsty, flesh-eating, multi-limbed Vedic / Indic / Hindu deity. Today, this Hindu deity (Mahākāla, a “terrible” form of Śiva) is portrayed as a harmless, human-like, potbellied, jolly fellow in Japan’s religious pantheon. His Japanese name is Daikokuten. Today Daikokuten remains one of Japan’s most popular gods of good fortune (e.g., abundant harvests, well-stocked kitchens, lucrative livelihoods). In his standard modern form – portly, dwarfish, jovial, wearing a hat, holding a treasure sack, traveling everywhere to dispense fortune to the people – he is strikingly similar to the Christian world’s Santa Claus. The second goal is to underscore the strong influence of India (rather than China) on Japan’s pantheon of gods. In many ways, the religious landscape in Japan is more akin to Japanese Hinduism than to Chinese Buddhism. The third goal is to provide scholars, art historians, curators, teachers, & students with a “jumpstart” visual guide to the richness & dynamic complexity of Japan’s religious art. Nearly two millennium of Śiva artwork is organized chronologically & thematically herein. Given space limits, the guide’s “visual canvas” includes art from only India, Central Asia, China, & Japan. Center stage is given to Japanese art from the 9th to 21st centuries. This annotated visual tour features over 100 photos from China’s Mt. Tiāntái region, the home of Tiāntái Buddhism (originated late 6th century). 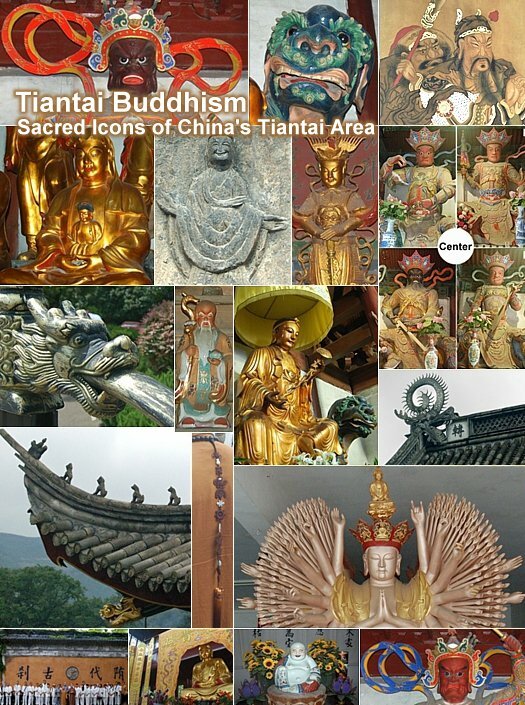 Tiāntái is the first Chinese school to break significantly from the Indian tradition and therefore represents China’s earliest indigenous Buddhist system of thought. The Tiāntái school also became the foundation of important Buddhist schools in Korea and Japan. The slideshow’s cast of characters includes the Door Gods Ha (the Blower) and Heng (the Snorter), Vedic Sea Monsters, Rooftop Beasts, Four Heavenly Kings, Perfected Saints, Folk Gods, a Booze-Guzzling Drunk Monk, a Pot-Bellied Gate Guardian Serving as Lord of the Dinning Hall, a Carp Transforming into a Dragon, Magical Lions, and more. This cast of characters is found in myriad Chinese temples and thus serves as a microcosm of modern-day Chinese Buddhist artwork and faith. This slideshow is intended as a “primer” for students and teachers of Chinese Buddhist art and folklore. There are two versions. Fully annotated version includes explanatory notes, references for further study, and detailed captions. Minimally annotated version includes only captions. It is better suited for classroom presentation.